Home / Solutions / Case Studies / Sports / The new installation at VfB Stuttgart provides outstanding light quality meeting the requirements of DIN 12193. 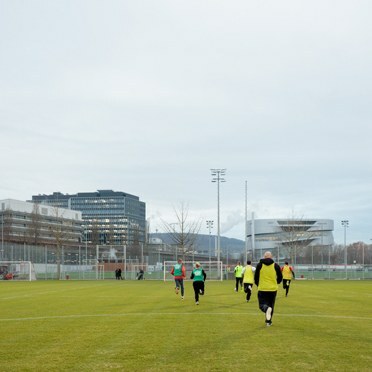 Thorn recently provided new lighting for three training pitches for VfB Stuttgart, one of the top football clubs in Germany’s Bundesliga. It’s the latest of a number of projects that Thorn has been involved with at the club, including lighting for both indoor and outdoor areas. 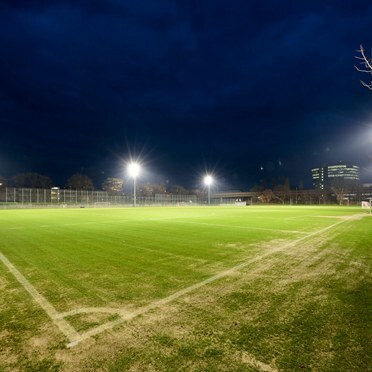 VfB Stuttgart wanted the three pitches, which have recently been completely rebuilt, to be lit to 300 lux in accordance with the DIN 12193 standard for sports lighting, with the option of increasing light levels in future by adding more luminaires. 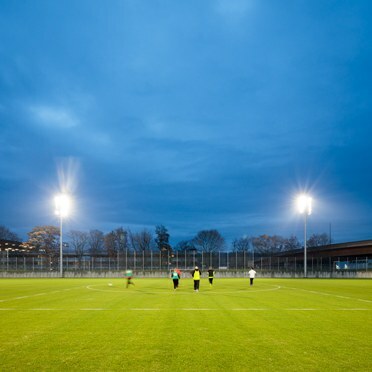 Glare had to be very carefully controlled because the pitches are located near to a major road, and the positions of the six 25-metre poles that hold the luminaires was already determined for geological reasons. 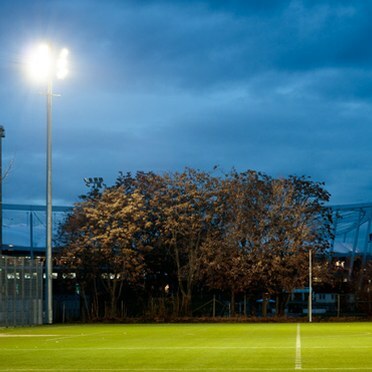 Thorn installed 60 Altis LED luminaires, designed specifically for sport and area lighting. Altis LED can be equipped with one, two or three LED modules providing a total of up to 176,000 lumens of light, and its flexible optical system enables numerous combinations and configurations, minimising the number of luminaires needed in an installation. Altis LED’s modular construction provides the possibility to not only mix different optics, but also to tilt each individual LED module to optimise the lighting design process. At VfB Stuttgart, a combination of medium and wide-beam versions with symmetrical distribution were used, with modules adjusted to achieve the right distribution of light. 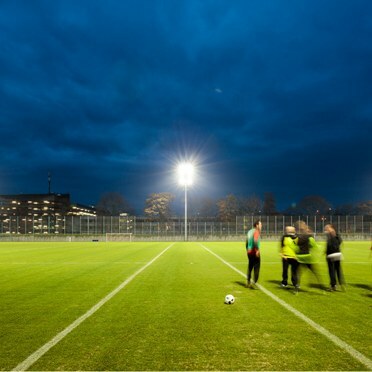 On the two larger pitches, luminaires with three LED modules were used, while for the smaller pitch, luminaires with two modules were installed. The new installation at VfB Stuttgart provides outstanding light quality for these important training areas, with a neutral colour temperature of 4000K and a colour-rendering index (CRI) of 70. The light meets the requirements of DIN 12193, which calls for 300 lux, a minimum-to-average uniformity ratio of 0.7 and a glare rating below 50. The Altis LED luminaires are arranged vertically on the specially-made 24-26-metre poles, creating an impressive daytime appearance. It’s a great result for VfB Stuttgart, especially as the club prepares to host games for the 2024 European Championship.